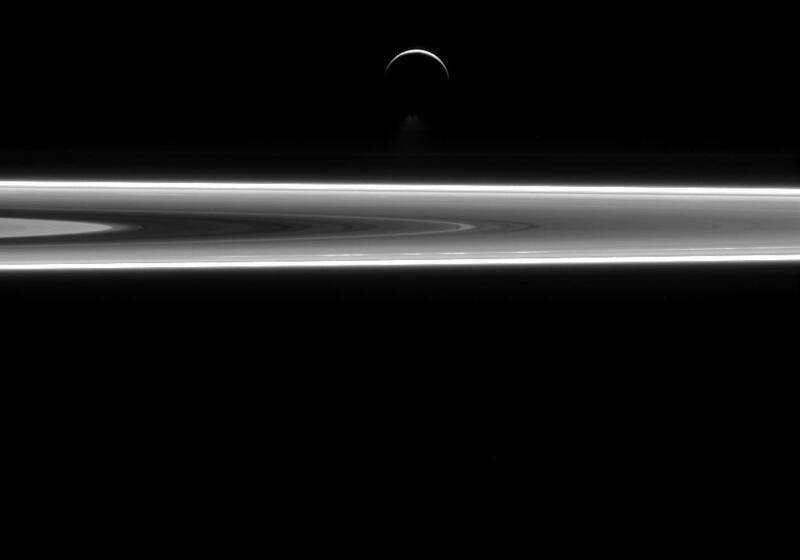 Explanation: Saturn's icy moon Enceladus poses above the gas giant's icy rings in this Cassini spacecraft image. The dramatic scene was captured on July 29, while Cassini cruised just below the ring plane, its cameras looking back in a nearly sunward direction about 1 million kilometres from the moon's bright crescent. At 500 kilometres in diameter, Enceladus is a surprisingly active moon though, its remarkable south polar geysers are visible venting beyond a dark southern limb. In fact, data collected during Cassini's flybys and years of images have recently revealed the presence of a global ocean of liquid water beneath this moon's icy crust. Demonstrating the tantalizing liquid layer's global extent, the careful analysis indicates surface and core are not rigidly connected, with Enceladus rocking slightly back and forth in its orbit.